Nominations for the 2019 Ann M. Weaver Scholarship have closed. We look forward to learning more about the nominees and will annouce the winner of the scholarship at the end of March. The Ann MacPherson Weaver Memorial Scholarship was established in 1986 in memory of a 1984 RMA graduate who had succumbed to cancer earlier in the year. This competitive scholarship is awarded each year to a deserving student who best represents the scholarship criteria and who has never attended any grade of Rocky Mount Academy. Any student who will be a rising ninth, tenth, or eleventh grader in the 2019-2020 school year and has never been enrolled in Rocky Mount Academy at any time is eligible to request an application for the Weaver Scholarship. You can be nominated by a member of the community at large, the RMA community, or you can self-nominate. The scholarship pays for the winner's tuition every year until graduation, with merit reviewed annually. Aurora Madison Henderson, daughter of Mr. Christopher Henderson and Dr. Jessica Henderson, has been awarded this year’s Ann MacPherson Weaver Memorial Scholarship at Rocky Mount Academy. 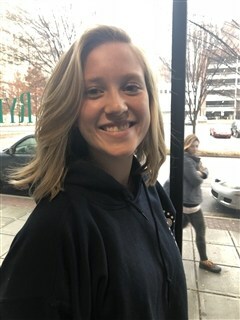 Currently an 8th grader at Magellan Charter School in Raleigh, Henderson will attend RMA in the fall on a full-tuition scholarship, valued at over $45,000 for four years. The Weaver Scholarship was established at Rocky Mount Academy in 1986 in memory of a 1984 RMA graduate who had succumbed to cancer earlier that year. The scholarship is awarded to a deserving student who has never attended RMA and who best represents the attributes that Ann Weaver embodied. “Once again, we had a wonderful and accomplished group of candidates nominated for the Ann Weaver scholarship,” Janie Mac Pittman, part of the Ann Weaver committee stated, “And once again, choosing this year's Ann Weaver scholar was very difficult. Ari's impressive academic and extracurricular resume along with her caring personality, make (or made) her an ideal Weaver scholar. We are excited for Ari to join the RMA family in the fall." Henderson is a straight A student. Her talents stretch from the tennis court to the canvas. She is a self-motivated artist and athlete. She has designed her school’s yearbook cover, received a teacher nominated Integrity Award, painted murals on her school campus and won various design competitions. Ari has served as the Magellan tennis captain and twice been the recipient of the Coaches Award. She also is a competitive swimmer on the Stonebridge Swim Team. She always has a passion for helping others as seen in the variety of community service projects that she has been involved with over the years. Ari has helped with food drives, Backpack Buddy ministry, and international nonprofits as well. Rocky Mount Academy is overwhelmed and excited for her to bring her passion and drive to their campus. Founded in 1968, Rocky Mount Academy is the largest non-sectarian independent school in the Nash/Edgecombe/Wilson area and serves PK-12th grade students. The mission of RMA is to prepare its students for the challenges, opportunities, and responsibilities to be encountered in life and college.